The rink will not open this year. It was open November 27, 2004 - January 9, 2005. Outdoors. This is the first year of operation for this rink. The rink is almost square, with square (not rounded) corners. An early evening session was quite crowded, but a later session was empty. 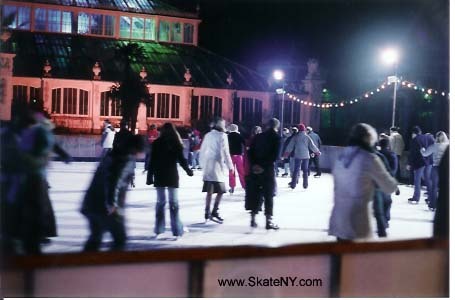 Ice conditions were poor, as the ice was resurfaced only a few times a day and not after each session. Music was difficult to hear from most spots on the ice. Skate rentals included in admission fee. Coat check is available for £1. The cafe has a decent selection of snacks, including various hot chocolates. Photography is not permitted while the photographer is on the ice - the ice marshalls enforce this. A convenient way of getting to the rink is to take the "tube" - the (green) District line, towards Richmond, to the Kew Gardens station. 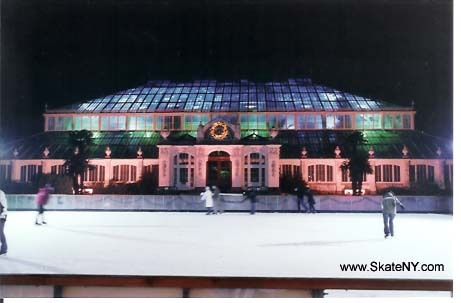 The park is a short walk from the station, and the rink is a short walk inside the park. The neighborhood is quiet at night.